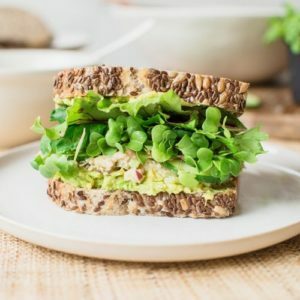 A quick and easy smashed Chickpea Salad Sandwich. 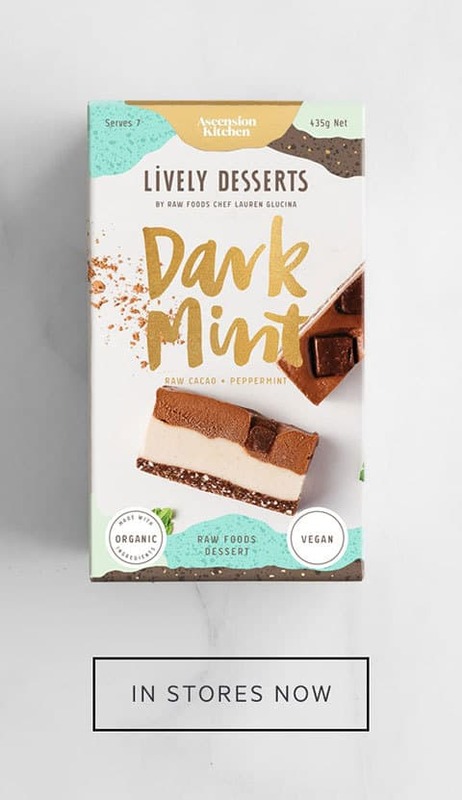 I’m sure this will fast become your new go-to for work lunches or even picnics. 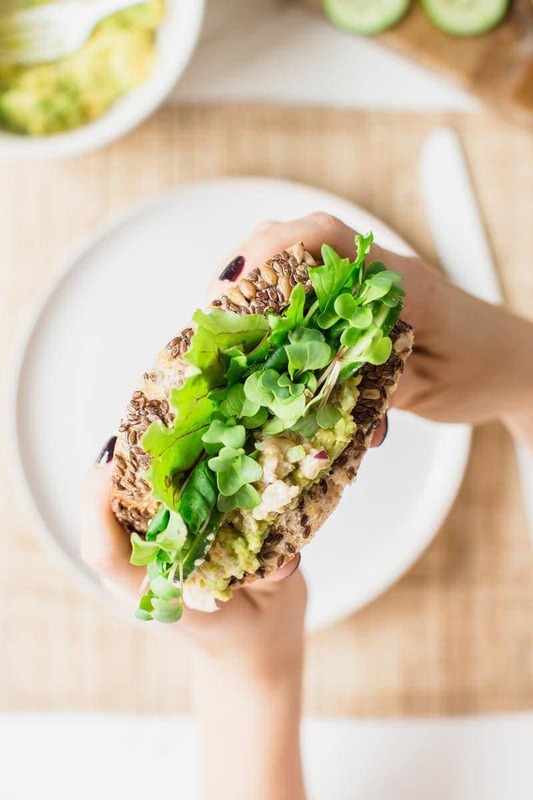 Chickpeas are mashed and combined with celery, red onion, gherkins, tahini, lemon and coconut yoghurt to give a creamy, salty-tangy filling – making an incredibly substantial and satisfying sandwich. 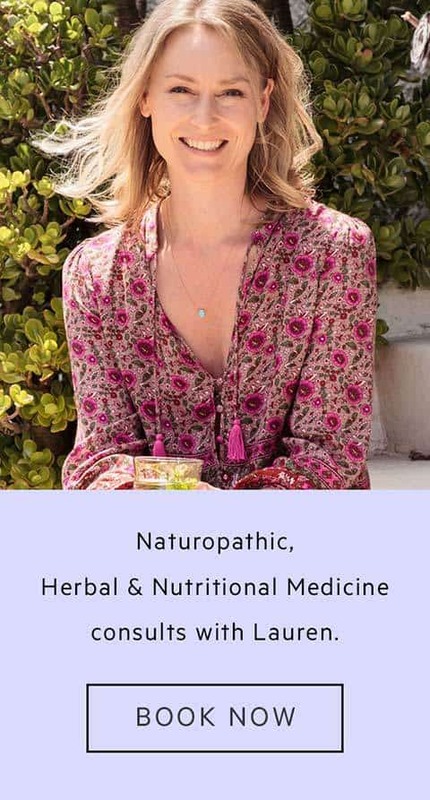 My brother’s wonderful partner Elise is a fellow foodie, plant-lady, tarot and crystal loving hippy like me. 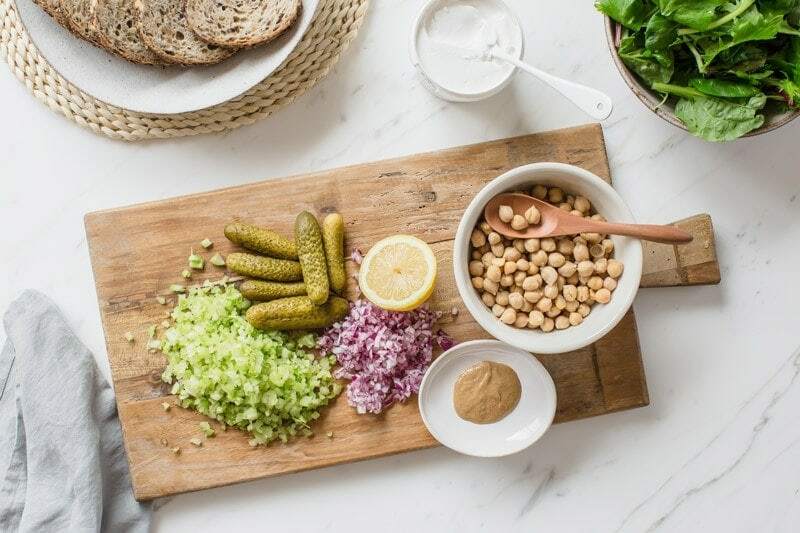 She came to visit the other day with a sample of this delicious chickpea smash she’d made – quick (15 mins), easy, healthy and delicious – it absolutely had to make an appearance here on the blog. 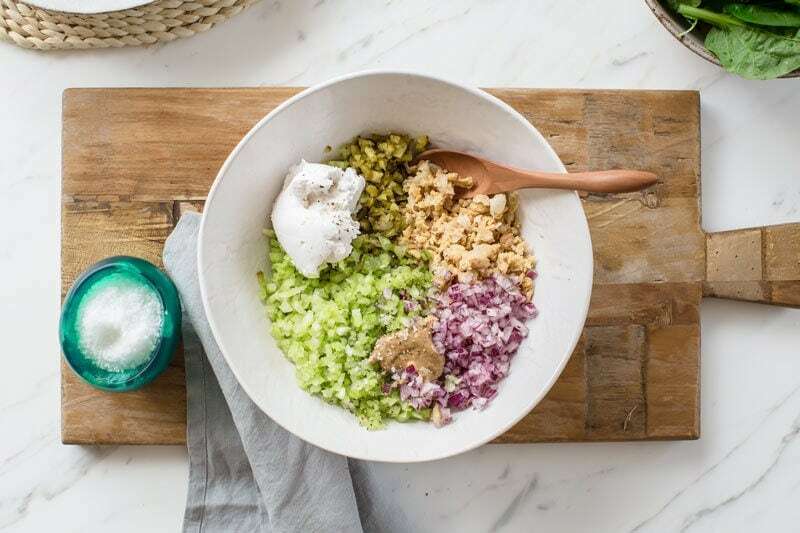 It is a one bowl mix of chickpeas with finely diced celery, red onion and gherkins, with some lemon juice, salt and pepper, and creamy tahini and coconut yoghurt to round it out. 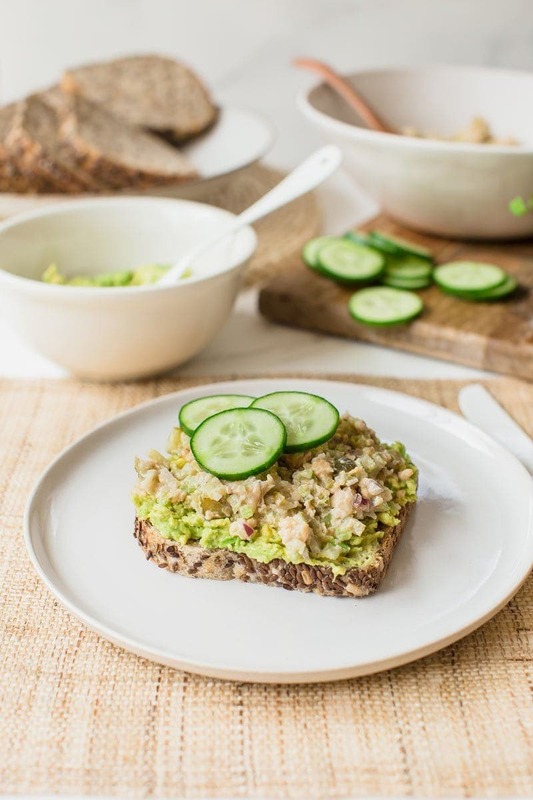 This combination very loosely reminds me of a creamy chicken, egg or tuna salad sandwich filling – but it is so much better because it is entirely plant-based! 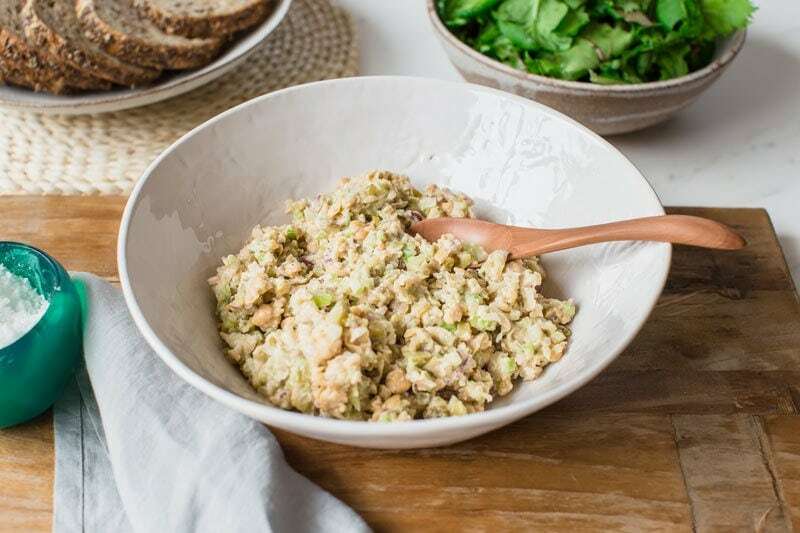 Making the chickpea salad sandwich filling is as simple as anything – mash, dice, combine. You can add further spices to your liking such as cumin powder or chilli, or even a little Dijon mustard with a dash of black salt – which has a unique sulfur like taste and hence mimics eggs well in veganised recipes. I’ve photographed this as a sammie made from rustic seeded sourdough, fresh greens, sprouts, crunchy cucumber and mashed avocado. And if you have the time to make bread from scratch – I’ve got a fabulous recipe here for a gluten free Buckwheat and Millet loaf. A lighter option would be to use a wrap, either grain based or a raw, dehydrated flax and vegetable number similar to this one. Raw onion bread would also be a winner. 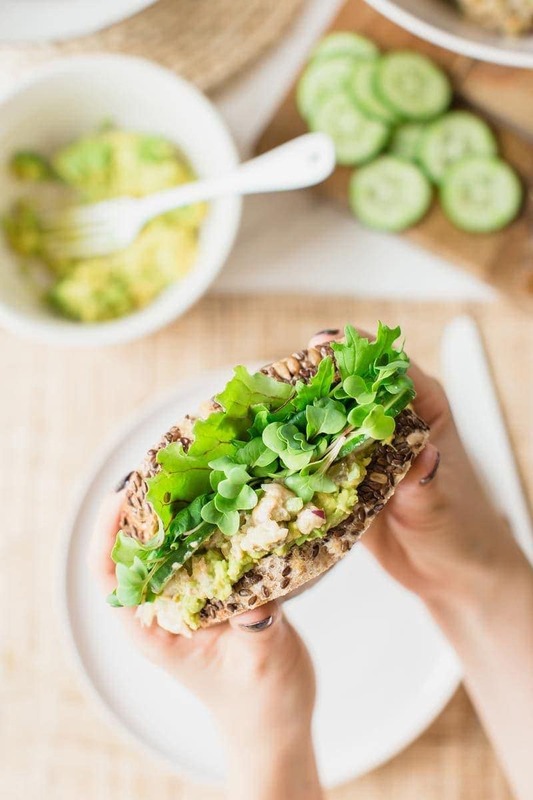 And even lighter still – spoon the smashed chickpea mixture into lettuce cups with a little quinoa and a dollop of avocado. Now, I’ve given credit to the fabulous Elise for this creation, but I must also tip a hat to my photographer extraordinaire – my lovely partner Stipe. He snapped the pic of me below holding that mammoth sandwich, and is pleased as punch with how it turned it out (I’ve been trying to get him a little more familiar with the old camera for such occasions). So, full credit to you, S. Vezich Photography! Enjoy guys – take this one and make it your own with whatever herbs and spices you prefer. Thanks for reading and see you next week. 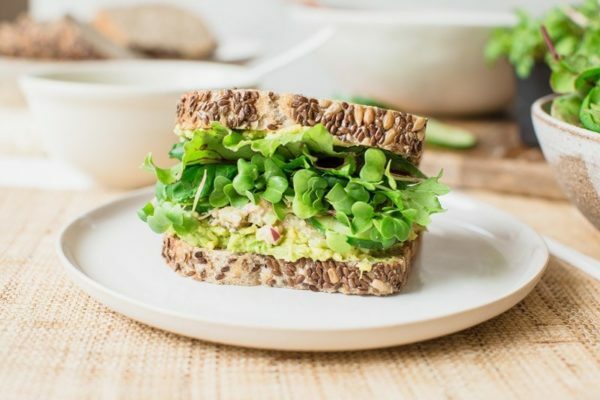 15 minute smashed chickpea filling ideal to make one delicious salad sandwich! Yields 6-8 serves (approx. 1/3 cup per). Nut free. Finely dice the celery, red onion and gherkins. Mash the chickpeas with a fork then combine all ingredients in a large bowl. Mix well to combine. Season with salt and pepper. Enjoy as is, or make an epic sandwich – pairs perfectly with avocado! (Doesn’t everything?). Estimated nutritional information is for one serve (approx. 1/3 cup) of the smashed chickpea filling only.